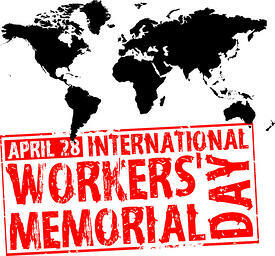 “Mourn the dead, fight for the living”; this is the motto of the International Worker's Memorial Day held every year on April 28th. Every year, more than 4000 workers die on the job. Each year, we honor those who have died by taking time observe workplace safety and remember those who paid the ultimate price while doing their job. This year, we’d like to focus on Hazardous Energy Control. In preparation, we have compiled some tips on how to participate in this memorial. Hydraulic Potential Energy: This energy is stored in a pressurized liquid; under such pressure the fluid can move heavy objects, equipment and machinery. If it is released in an uncontrolled manner, a person can be crushed or struck by the object. Pneumatic Potential Energy: This energy is stored in pressurized air and can also be used to move heavy objects and power equipment. If released in an uncontrolled manner, a person may be struck by or crushed by the object. Chemical Energy: This is when a substance is subjected to a chemical reaction. When released incorrectly, the hazardous reaction is an explosion or fire. Radiation Energy: This energy comes from an electromagnetic source; it covers all radiation from visible light to X-rays. Radiation energy can cause eye damage and cancer. Gravitational Potential Energy: This energy relates to the mass of an object and the distance it is from the ground. Mechanical Energy: This contains an item under tension, like a spring or coil ready to release. This energy can cause crushed or struck by injuries. Gather the necessary information about the installation process of parts, where the energy isolating device is located, step by step procedures for maintenance, and how to address any unplanned interruptions safety and efficiently. Complete a task analysis to examine the intended uses of the system from both the manufacturer and user point of view. When performing this analysis consider the setup, modes of operations, normal and emergency stops and starts, troubleshooting, planned and unplanned repairs and maintenance, and general housekeeping and cleaning. Upon compiling the information from the above two tasks, begin a hazard and risk analysis; this should outline where the potential hazards are. This analysis should outline any and all situations where workers can be exposed to hazards. Implement the necessary controls for the hazards and risks that were identified; i.e. which de-energizing devices are necessary, etc. While prevention is the surefire way of avoiding an incident, there is always the human element involved. This is why training your supervisors and workers to understand and recognizing hazardous conditions can be a great step towards avoiding future accidents. There are many opportunities to participate. April28.org has an event map of all major events worldwide. OSHA also has a dedicated page for the event. For more information on the prevention of hazards and how your company can better improve safety culture in the workplace, feel free to download our free safety manager’s guide to safety training.